What could be more joyous than a Kilcannon Christmas? But for Daniel Kilcannon, the man they call “The Dogfather,” this holiday season is anything but happy. It’s been three years since he’s lost his wife and though his family is growing – thanks to his matchmaking efforts – he still dreads the day his dearly departed wife used to love so much. Determined to make Christmas Eve festive and fun, he puts his sadness aside for the family and pretends everything is normal…until it’s not. When a recently rescued puppy goes missing on Waterford Farm, all celebrations come to a halt. The entire family, from Gramma Finnie down to the youngest Kilcannon and their cousins, is enlisted on the search. Before they can continue the old Irish tradition of putting a candle in the window to welcome strangers, they must find little Jack Frost…and nothing short of a Christmas miracle can make that happen. Daniel Kilcannon is known as "TheDogfather" for a reason. It's not just his renowned skills as a veterinarian, his tremendous love of dogs, or the fact that he has turned his homestead in the foothills of the Blue Ridge Mountains into a world class dog training and rescue facility. Ask his six grown children who run Waterford Farm for him, and they'll tell you that their father's nickname is due to his uncanny ability to pull a few strings to get what he wants. And what he wantsis for his four sons and two daughters to find the kind of life-changing love he had with his dearly departed wife, Annie. This old dog has a few new tricks...and he'll use them all to see his pack all settled into their happily ever afters! A short Christmas story as part of the series. It was OK as a filler. This is a wonderful sweet story of family, love, and facing the holidays without a couple of their loved ones but with some new additions to the Kilcannon clan. Daniel Kilcannon is trying to put on a happy face for his family while missing his wife terribly. Adding to his sadness is the fact that one of his sons won't be home with him this Christmas. As always with this family it's a little dog that pulls them together and helps to distract from any sadness. A great story that should be on everyone's holiday reading list. I highly recommend it. 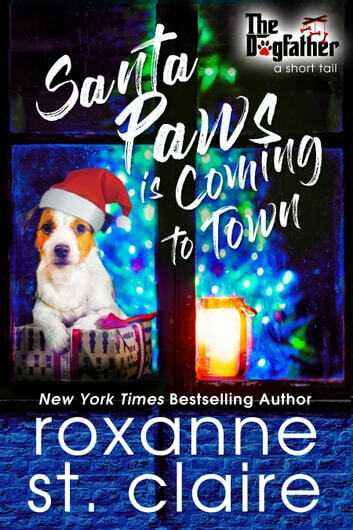 Santa Paws is Coming to Town by Roxanne St Claire A Christmas novella from the Dogfather contemporary romance series. Sentimental. Holiday tradition. And thankful tears of joy. Holidays and family. Sweet. Once again Roxanne had me laughing and crying in her dog father series! I moved it and can’t wait for the next one!